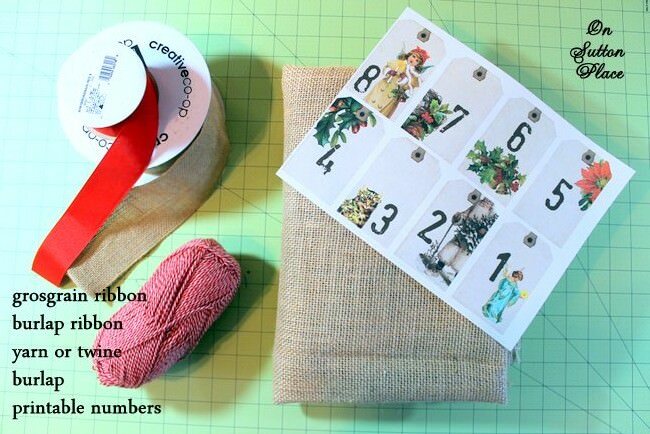 As promised here I am with the how-to for my Advent Calendar. From start to finish it took me a little over two hours. Not a bad time investment for something that will last through the years. I think this will grow with your children. When they are young the pockets can be filled with small toys or stickers. 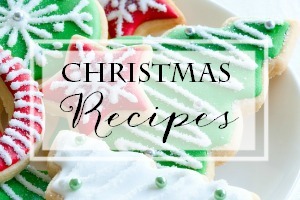 As they grow older, mix candy canes with gift cards to McDonald’s or iTunes! Let’s go. 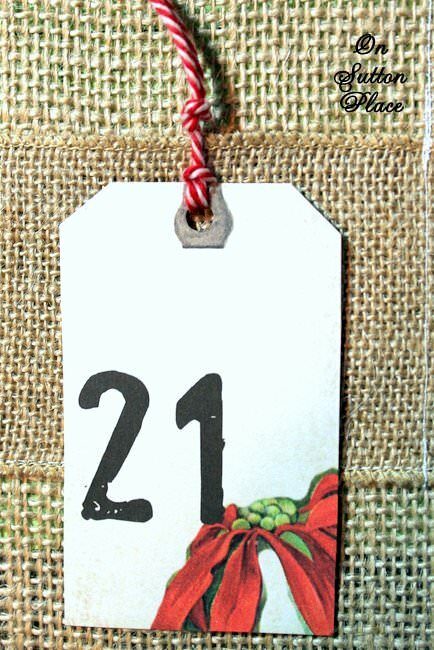 To make the tags: I searched Etsy for number tags and advent calendar printable. The tags I used for this project are, sadly, no longer available. Here are a few other options. 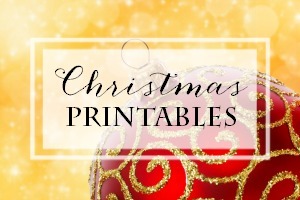 Countdown to Christmas tags, Printable December Daily Numbers. Print them on card stock. Cut out. Punch holes. 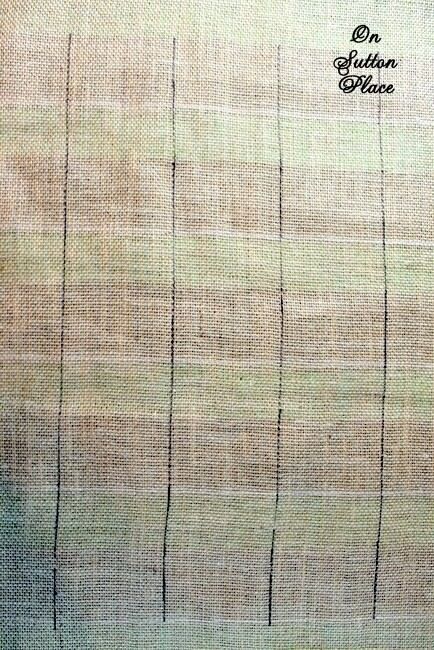 Cut a piece of burlap that measures 26 x 32 inches. Follow these directions to keep it all straight. Pull about 5 strings from each side to create the fringe. 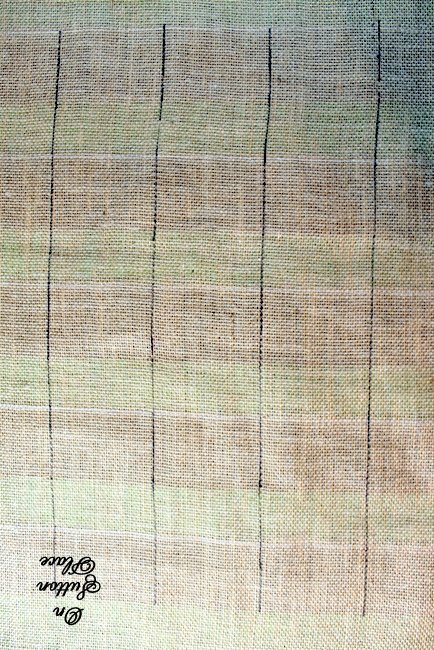 Mark horizontal lines on the front as markings for your rows of ribbon. The first row should be about 7 in. from the top. The next four rows should be 5 inches apart. When you are finished marking you should have 5 rows. 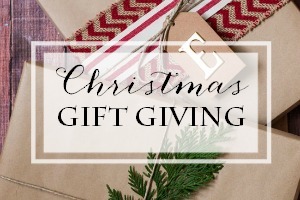 Cut 5 pieces of 3 inch burlap ribbon about 30 inches long. My ribbon was wired but it would be fine if it’s not. Turn the ends under like pictured above. 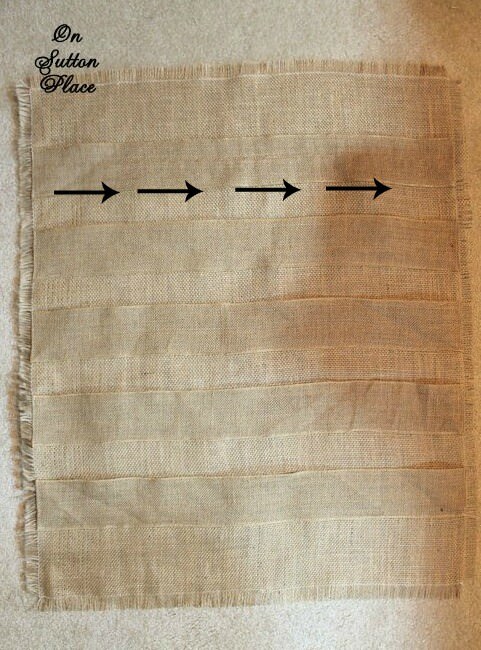 Sew on the ribbon with the bottom of the ribbon length lining up with your markings. Make sure to sew the ends. This is what it will look like at this point. 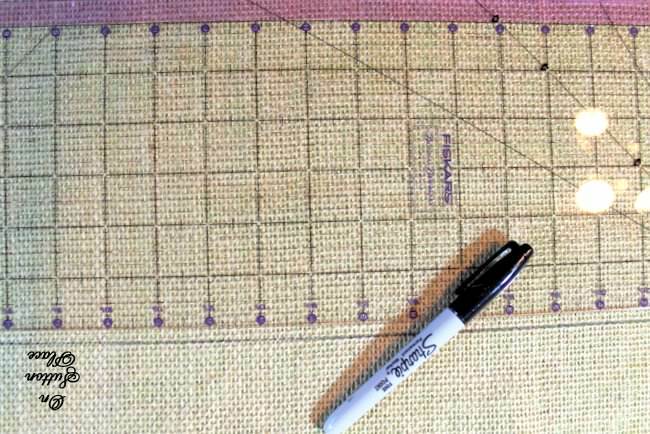 The arrows are following the stitching line. 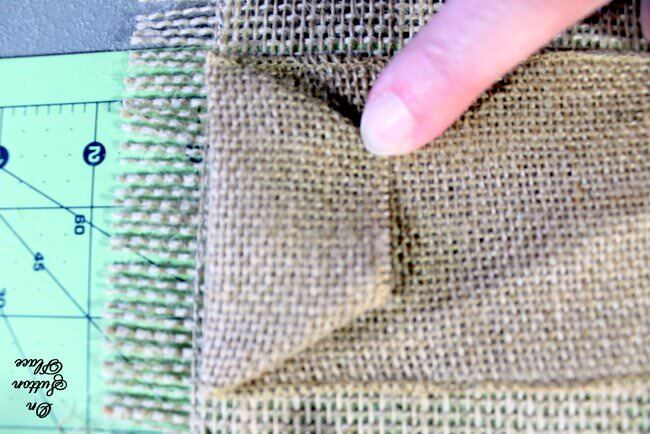 To make the pockets: turn the burlap to the opposite side. Mark lines going vertically. The first line should be 2 inches from the left side. Make 5 more vertical lines 4 inches apart. Sew along the lines. 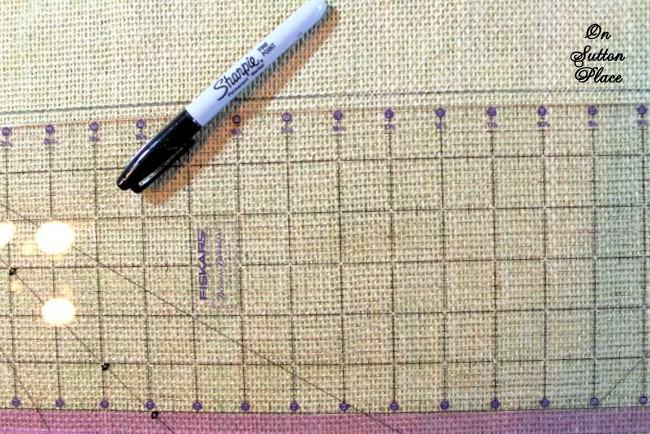 There should be 6 lines, 6 vertical rows of stitching. To make the casing for the dowel rod, sew a length of 1 1/2 in. grosgrain ribbon across the top leaving the ends open. 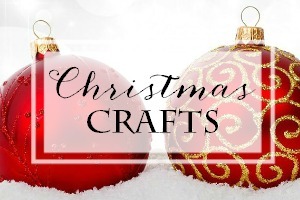 Cut 25 pieces of yarn or twine 12 inches long. String them through the tags. To attach the tags make a small opening on the front of each pocket with a pin. Pull one string through the little hole and tie it off. 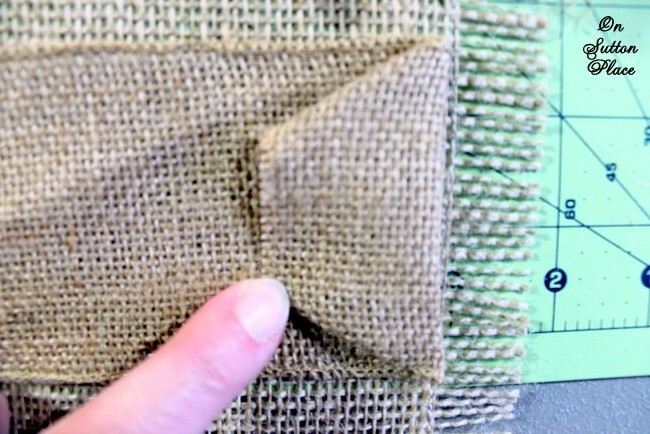 Trim and tuck the ends in the pockets. Insert a dowel rod in the casing. 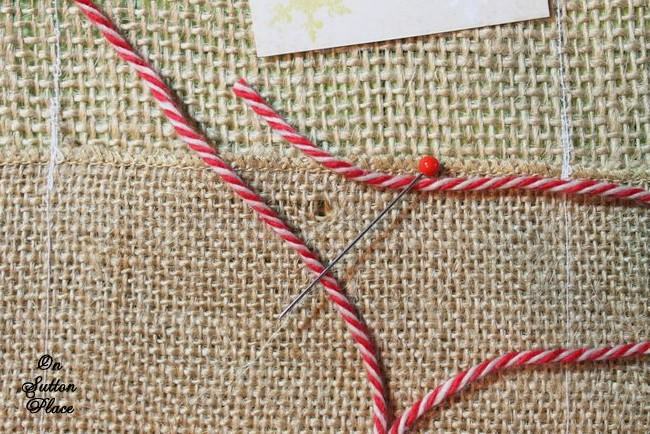 Add the hanger by tying a length of ribbon to each end of the dowel rod. Click any of the images below for more inspiration! What a wonderful idea, simple yet gorgeous. This is so darn cute and fun, Ann! Congratulations to whoever was the winner! I’m sure they will enjoy it for years to come. 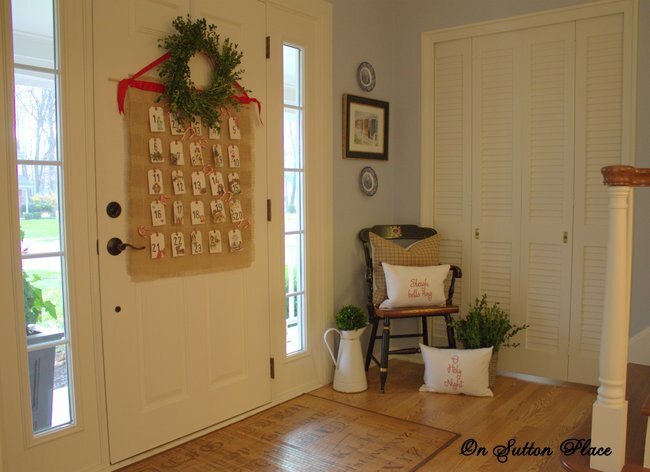 I love it – the burlap, cute tags, and wreath on top are sweet. My kids like to just have chocolate in their advent calendar. I often have to ship one out to whoever is at university so I try to keep it simple. 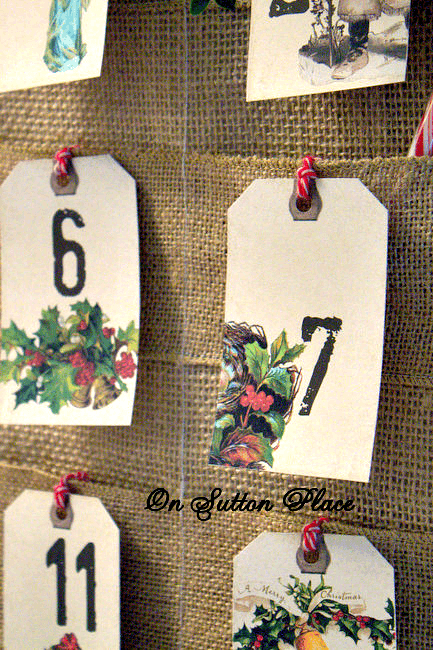 I just love tags so of course I love this Advent calendar project, Ann. That is a lovely, I think it would be a lot of fun for kids. Thanks for stopping by Ann, its always a pleasure to hear from you. Your Advent Calendar is beautiful, Ann! Just another example of your amazing creativity and vision. 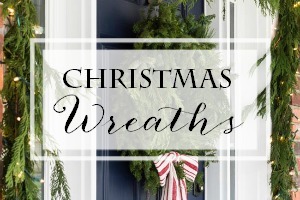 And, it looks great on the back of your front door … a fabulous focal point for your entry. Thanks for the tutorial, too … alas, mine would look nothing like that if I even attempted to make one, so I’ll just enjoy yours! 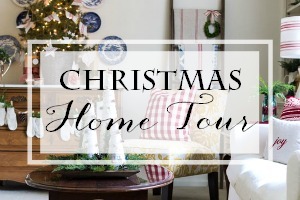 Look forward to seeing more of your holiday home. 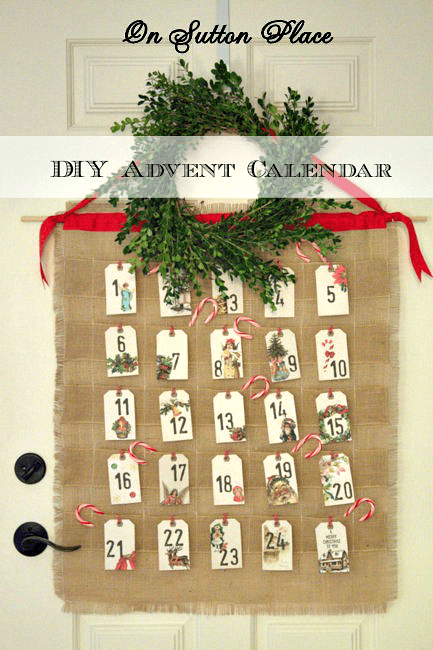 Beautiful advent calendar Ann, I like the little pockets idea. Too bad I missed your giveaway, I would have entered for sure! Have a nice weekend. Such an adorable calendar Anne! 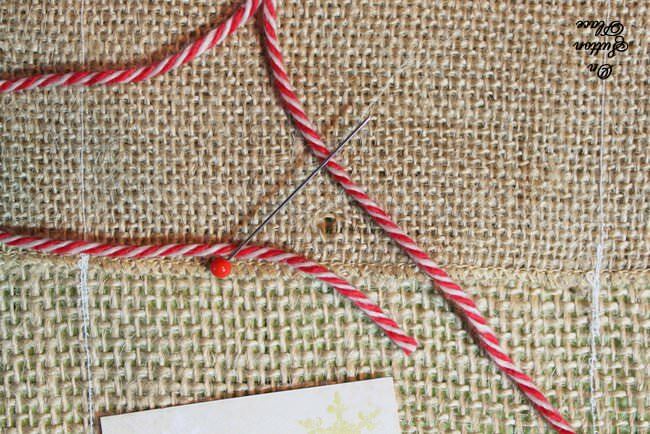 Good tip on keeping the burlap straight – that can be so tricky! ANd love those sweet tags too! Great tute! Hi Ann, Love your Advent Calendar! Happy Thanksgiving to you too. I love it! Your talent continues to amaze me. I love those tags and the twine. It’s gorgeous. Happy Thanksgiving, my dear friend! Great, detailed tutorial and it turned out wonderful. 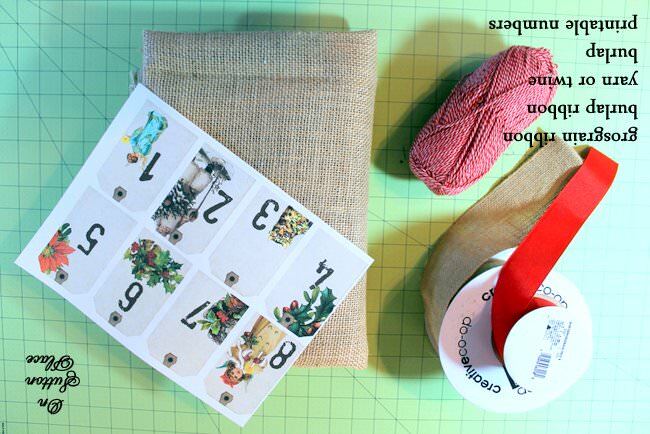 I love the vintage tags you printed off, they are just perfect for the project. Hi Ann, I love this project. I love the way it looks and all the materials you used. It looks beautiful hanging on the door. Love it!!! My kids would LOVE to do something like this! I just love this project! And thanks so much for that amazingly helpful tutorial! Wishing you a fabulous Thanksgiving celebration!